The so-called experts at Wikipedia have an article on OpenStreetMap much funnier than this one. OpenStreetMap(OSM) is a Project exclusively run by nerds and hackers. Its declared goal is to put the geoinformation of all fire hydrants and their friends the trees on earth into a giant database. 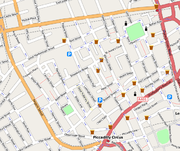 Since it is easier to make up plausible geolocations for fire hydrants if you have some other data aswell they also map streets, buildings and forests. Only if a contributing person is either too stupid or not creative enough to make stuff up he is allowed to use GPS and obtain actually correct information. The gathered geodata then is rendered into maps wich are free to use but no one wants anyway. The old way was to WALK or use a bicycle when gathering data with a GPS-tracker. As of now there are over 9000 cats which have been equipped with GPS devices which are being referred to as CatOgrafers. You can attach tags to geopositions, wich should indicate something about what is there - like a fire hydrant. Or what you made up about that spot (like a non-existing fire hydrant). Since only nerds and hackers work with OSM they invent new tags all the time. As a rule of thumb a tag is only worth anything if it is used AT LEAST 9000 TIMES!!! From time to time fellow mappers meet up near a fire hydrant to explore some unknown areas and gather new geodata. These gatherings are calles mapping parties and sometimes they are just parties without mapping, sometimes they are mapping without party and sometimes they are neither nor. Although the project started in Great Britain they are now too busy drinking tea so it has nearly come to a halt there. In the USA everyone who contributes to the project is considered a Terrorist and will be sent to Guantanamo Bay. Since in Germany so many people were bored, unemployed or both, that the exact location of every fire hydrant is already known. Uncertain what to do now mappers started to build new hydrants and some even started to map other stuff. One of the emerging ideas was to locate all the places where you can buy sausages that are filmed by a surveillance camera. Since it is probable that this will be achieved in the near future aswell some mappers are slowely starting to think about if there is anything useful one could do with maps. No vandalism, no fire hydrants.. but there are cats. Actually it should be called OpenFireHydrantMap, but that since that sounds stupid and all good acronyms have exactly three letters it was called OSM. This name also has the benefit that it sounds as if it had something to do with streets - and thus be useful for anything. Vandalism is a huge problem. Since everyone can change the data it has become very accurate in some areas. Loads of mappers are upset, because other things than hydrants are being mapped and that made up hydrants are viciously removed. If you want to vandalize the original concept by adding actually valuable content you can do that here. This page was last edited on 11 September 2012, at 03:09.